Preheat the oven to 350º F. Sift together the flour, cardamom, baking powder, and salt, then set that aside. With an electric mixer, cream the butter and sugar for 2 to 3 minutes, until it is light. Add the egg, vanilla, lemon juice, and lemon rind, and beat until fluffy. Mix that mixture into the dry ingredients mixture until combined and smooth. Drop onto ungreased cookie sheets 1 1/2 inches apart with a teaspoon, flattening each cookie slightly with your fingertips IF DESIRED. 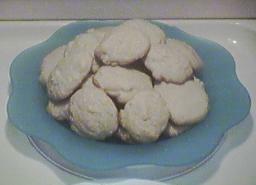 (If you don't flatten them a little, they will look a bit more like puffs rather than cookies, but they will taste fine; it's more of a preference really. They don't spread much when they bake.) Bake 12 to 15 minutes or until light brown. Cool on the sheets for one minute, then transfer to a wire rack and let cool.